Impact Hygiene has a supplementary anti-microbial program for its manual treatment of facilities called Germicide Misting. This process involves using a micron diffuser in the creation of a dry mist which will permeate the whole facility, covering each cubic inch of surface area. This method is used as a shock treatment against germs–wiping out 99.9% of all bacteria that either cause bad smell or sickness. It can be applied to walls of any kind, tabletops and counters, floors, doorknobs, switches, and just about anything your hands can touch at your facility. The sanitary condition of your restroom will be as close to hospital-like as possible. While Impact Hygiene’s service technicians may be experts in the disinfection of areas that employees or customers come in contact with, there are still nooks and corners of your facility that are hard to reach manually. This is what makes Germicide Misting more effective. 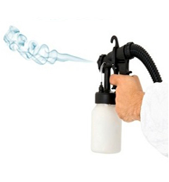 It eradicates germs in areas that manual sanitation procedures can’t reach, because it depends on the very same principle that germs or bacteria use in propagation: aerosolization. When flushing a toilet or a urinal, you may not be aware that a fine, almost imperceptible mist is produced–an unseen carrier of microbes and other similar unhygienic contaminants. Once it has become airborne, this aerosol will coat all exposed surfaces of your facility, creating unpleasant odours and providing a possible breeding ground for harmful microbes. In a similar way, the germicide misting process releases a mixture of our potent germicide, dispersing it throughout the entire facility. A very fine disinfecting fog is produced, coating all exposed surfaces and exterminating harmful and odour-causing contamination. As a result, your facility is more hygienic than it has ever been in years. Germicide Misting serves to complement our Impact Hygiene Service and Impact Clean services, offering you the most comprehensive and extensive Hygiene solution in the industry.